It's Friday and we were up early this morning to hit the streets and capture a few new and some older roller shutters that we have been trying to photograph for some time now. 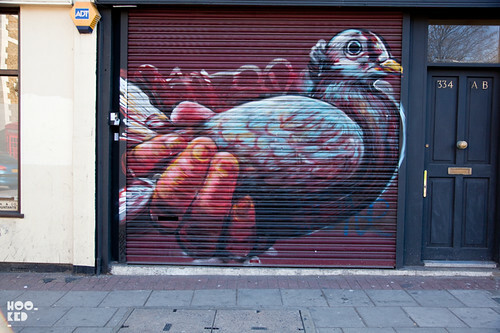 We have previously featured some awesome street art earlier this week on Hookedblog including the stunning new wall from Sheffield artist Phlegm as well as our photographic roundup of London Street Art and not forgetting the work of Spanish street artist PEZ who has been bringing a welcome splash of colour to the streets of Hackney. 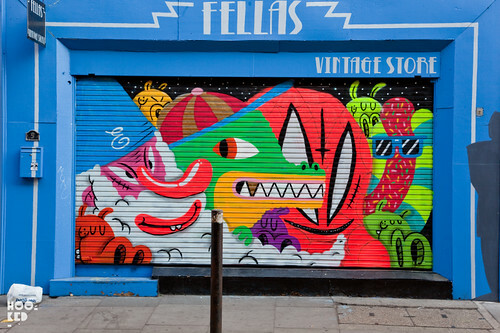 So here is a selection of what we photographed this morning, two new roller shutters from London street artist Malarky both collaborative pieces and both with Spanish artists. 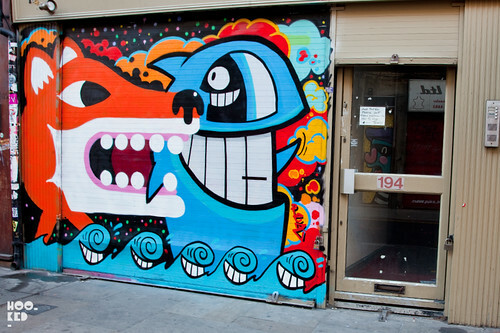 The first shutter is a collaborative piece with PEZ pictured above located on Brick Lane and the second shutter features the work of Barcelona artist eDjinn on Cheshire Street. 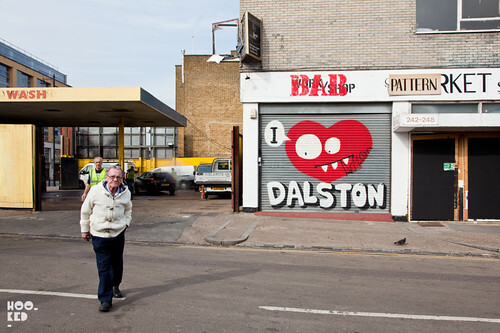 Up top is a classic piece from London based street artist Ronzo who loves Dalston unlike the grumpy old man in the photo! Triplets! And no, not the sequel to the 80s Twins movie that's just been announced!! But three new triplet owls from East London artist Dscreet. Finally, two older shutters featuring work from Gaia and Mr. Penfold, both in shops that always seem to be open! Very knowledgeable info, about shutters, i hope this is the best services in London.